For additional information about this book, visit the website www.K9firstaidandcpr.com. K9 Medic is about learning how to take care of your dog in the event of an emergency. Author, Eric Roth is a paramedic for a busy 911 system and has been teaching people how to save the life of their dog by using paramedic first aid techniques since 2010. Since there is no 911 for canines, Eric takes his world as a paramedic and his education in pediatric and advanced cardiac life support and then shows the reader how to apply it to dogs. In this book you will find a heart warming story how a 9 year old saved the life of a service dog. You will also learn what items to include in a first aid kit and much much more. The book gives to the readers confidence. Confidence that no matter what the situation involving their dog, they will not only be prepared, but be able to provide care for the best possible outcome. Content covers first-aid items including, first aid kits, torn pads, dog fights, seizures, broken bones, electrical injuries, muzzling, and bleeding control. There is special attention to choking, bloat, and poisons. Eric writes in a format is very conducive for learning and you will be better prepared to an emergency involving your dog. 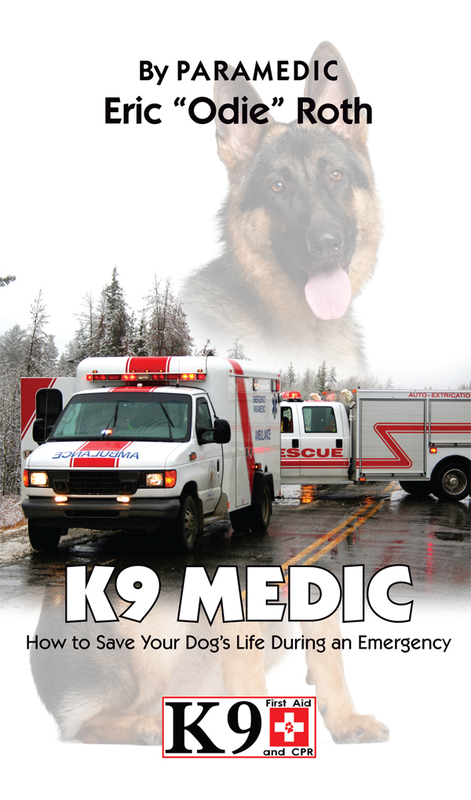 K9 Medic is a must read and a book that any dog lover will enjoy. Eric followed his childhood dreams of being a firefighter only to abandon the idea for a series of high paying sales jobs. Life took a turn with the unexpected tragic loss of his father he realized life is too short and needed a life change. Eric went on to be hired as a paramedic, and then started his own training company. Eric teaches both advance pediatric, and cardiac life support. He has been teaching K9 First-aid and CPR since 2010. It must be noted Eric is not new to saving dogs. One summer while at a picnic someone brought him a lifeless dog named Odin. Although never trained in K9 CPR, he applied his medical knowledge and was able to bring Odin back to life. Little did Eric know that years later he would devote his life to K9 first-aid & CPR. When teaching, Eric is most well-known for his compassion and his teaching style as he is able to make the material not only fun, but simple to learn. Eric continues to teach and work as a paramedic for a large city fire department.